The ArdaCraft launcher offers an easy way to install all the mods needed to enjoy playing on our server. The launcher automagically installs the correct Java JRE for you, so you won't need to mess around with installing the latest version. 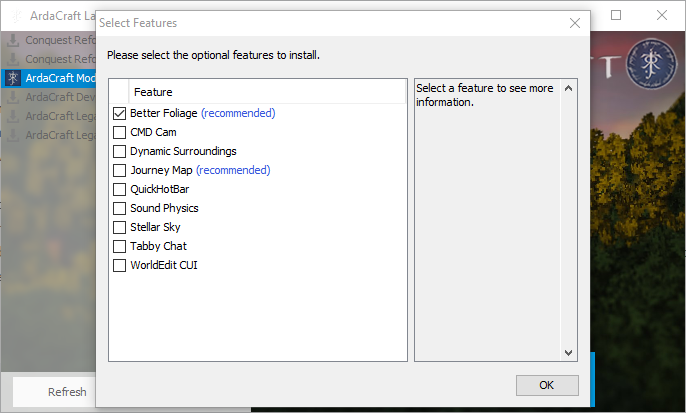 Run your downloaded launcher You may get a message that says this is not a trusted program, run it anyway. Note that the ArdaCraft Launcher will default install to a folder called ArdaCraft Launcher in your C:\Users\%yourusername\Documents folder. Once it is installed, select the Modpack which you prefer. The ArdaCraft Modpack 1.12.2 pack is the preferred version as highlighted below. The Conquest Reforged versions do not include the ArdaCraft Resourcepack, so if you plan on joining the ArdaCraft server be sure to pick one of the ArdaCraft Modpacks. Log in with your Minecraft account. This process uses the Mojang authentication service and we do not see any of your information. You will be given a screen showing optional mods that are in the pack. None of these mods are required to join the server and you may install mods as you wish. The launcher may take serveral minutes to download all the needed files depending on your connection. Once everything is installed Minecraft will start. Your game may freeze on startup and you may have a (not responding) message, this is normal just let it load. You now have everything you need to join the server. The IP is mc.ardacraft.me and you can view other conquest servers with the arrow on the right hand side of the Multiplayer page. 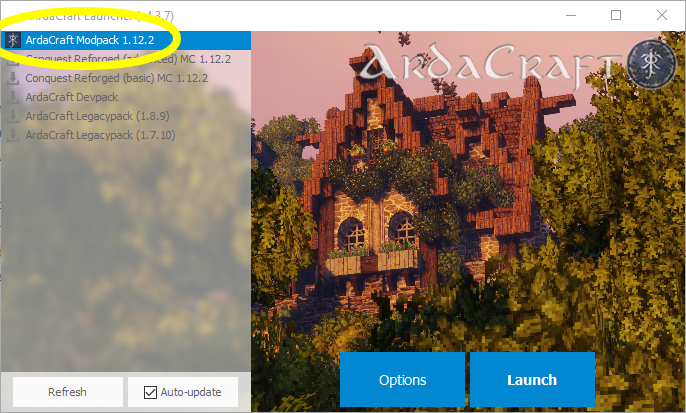 If you prefer to use the default Minecraft Launcher, or have troubles with the ArdaCraft Launcher, you can do a self-install. You can download the mods yourself, or download the mods used in our launcher here. First install Forge for Minecraft 1.12.2. Run Minecraft with the Forge profile enabled. Put the ConquestReforged-mc1.12.2.jar in your Minecraft's mods folder. Download Optifine for 1.12.2 here. Put the OptiFine_1.12.2.jar into your Minecraft's mods folder. 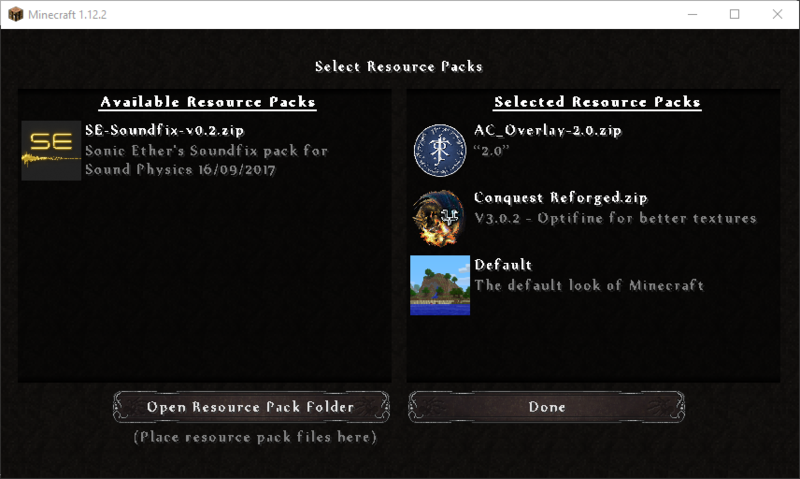 Download the ArdaCraft Resource Pack here as well as the Conquest Resource Pack here and put them in your resourcepacks folder. You now have everything you need to join the server. The IP is mc.ardacraft.me.